Home Port Gallery is a full-service art consulting firm. We personaly oversee all stages of your project. At our initial meeting we discuss the scope of the project, interior design elements, and work with you to understand your needs, goals, vision, taste and budgetary parameters. We then make recommendations and selections that will best fit your specific needs. We either work directly with the client or collaborate with interior designers, architects, project managers or facility supervisors of a space. There are many benefits to corporate art. Your employees. Today employees are working harder, longer, and giving a good portion of their time to the job. SImply put, artwork inspires the work place. Beautiful surroundings show your employees that their visual well-being is important to you, and therefore so are they. Home Port Gallery can transform any space into an inspirational, professional venue. Let’start the energy flowing from the inside out! Your customer. Art reflects your corporate personality. It’s subtle, yet dynamic. Whether you are a legal firm or a hospital, you want to give a professional impression. Art is the finishing touch. Update. 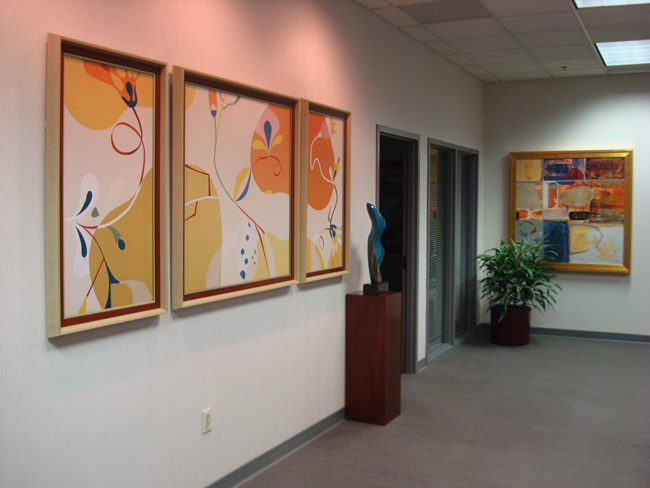 If you love your office art, but are constantly reminded that teal and sea foam went out in the 80’s – a new mat and updated frame will protect your initial investment and give it a face lift that will last for another 20 years. In many cases a new mat, clean glass and a contemporary frame give new life to your old art. Upgrade. If your corporate image has outgrown “inspirational posters” of the 80’s, perhaps it’s time for an upgrade. Beautiful limited edition giclees are extremely affordable, light and very contemporary. We can help. Upheaval. When your business or corporation moves to a new location, expands or redecorates, We are your one-stop solution. We can easily match your existing art to your new surroundings – and give you prudent advise regarding your budget concerns, mix in some newer styles, or even find matching or complimentary pieces. Opening April 15th in Apollo Beach! Copyright © 2019 Home Port Gallery. All rights reserved.